Safety in our schools is everyone's responsibility. If you are aware of a threat or a dangerous situation for our students or staff, it is important to share that information with a trusted adult, by calling 911 or by using an anonymous tip line. 24/7 Crisis Center Hotline at 1-844-SAF2SAY (1-844-723-2729). The tip is then triaged by the Crisis Center to gather enough information and is delivered to the impacted school and, as needed, local law enforcement via 911 County Dispatch. Anonymity is strictly protected unless the person submitting the information wishes to share their identity. If an individual abuses the system or breaks a state or federal law, the District can request a court order to uncover anonymity. Why Do We Need S2SS in Peters Township? 37% of threats of violence, bullying, etc. are sent electronically; 28% used social media. 80% of school shooters tell someone of their violent plans. 69% tell more than one person. Most mass shootings are planned for 6+ months. Up to 70% of people who complete suicide tell someone their plans or give some other warning sign. Youth typically display/present pathway behaviors / at-risk behaviors between the ages of 13-17. Programs like S2SS share options for students to alert someone to these incidents BEFORE they happen. The program also provides the important component of training staff members to identify the warning signs in students. 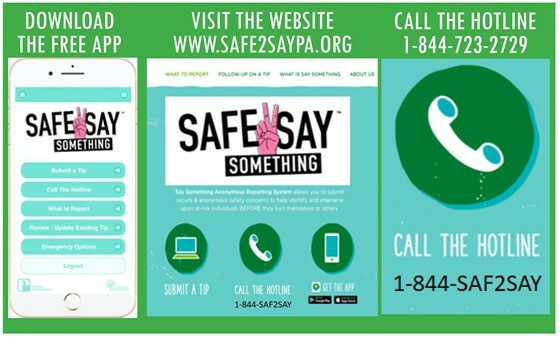 Students in grades k-6 may continue to use the Safe Schools Tip Forms found on each building's homepage. If the issue is urgent, please call 9-1-1.